The Iomega StorCenter PX6-300d is a fast, fairly well-designed six-bay NAS box sporting many of the advanced features in network-attached storage that have emerged over the past several years. It's a tad unusual in that it mixes IT-type features such as management via the unit's LCD display with consumer-oriented perks such as support for social media sites Facebook and Flickr. Flip open the front cover of the PX6-300d, and you'll find six slide-out drive trays. You secure the drives in the trays via screws, so they fall under the heading of user-serviceable, not quick-change. The back of the box has dual ethernet connectors with failover support in case one connection fails, but the ports don't support aggregation for more speed. Iomega includes two USB 3.0 ports, but no eSATA. The PX6-300d's Linux-based LifeLine operating system is one of the few that comes close to matching the breadth of features available from the top-of-the-line NAS boxes. It has an attractive design, provides animations to complement the configuration tools, and is easy to navigate. Features include DLNA-certified media serving, local backup, online backup to both Amazon S3 and Mozy, support for Time Machine and iSCSI, and onboard copy operations. The box also supports video surveillance--both local and over the Internet via the Axis Video Hosting service. In addition to handling backup, Iomega provides a Personal Cloud service that lets you share files easily across the Web. It uses Iomega's servers as a portal, but you can also access the box via normal ftp and http, which makes this a convenient feature. 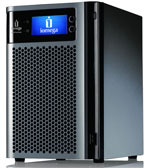 The PX6-300d is fairly inexpensive, even when compared to most five-bay models. With good performance and features, it's a great choice for companies that want the capacity but don't need an eSATA port on board.